Hi, friends! 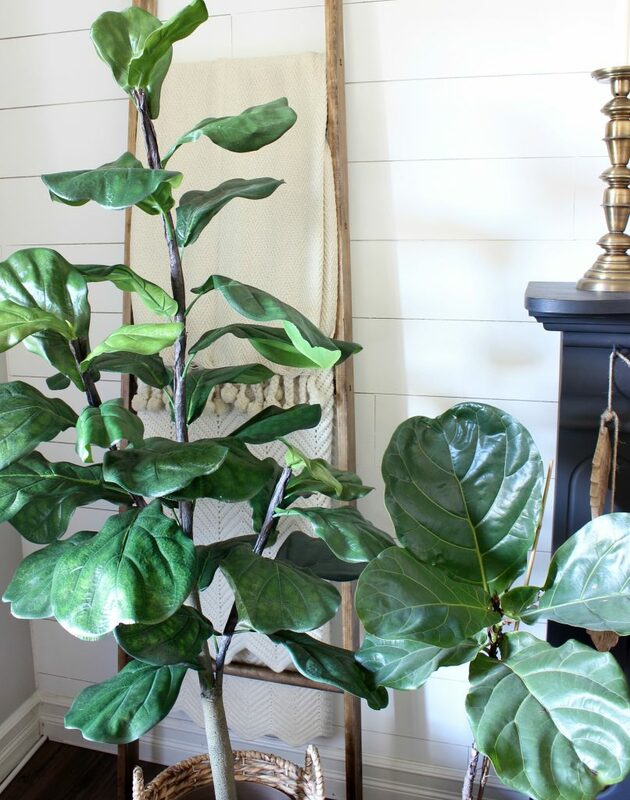 I’m finally here to share the review of the faux fiddle leaf fig tree that I purchased a few weeks ago! HERE is the one that I purchased. The tree came in a long narrow box and all of the leaves were straight up and flattened. But, with a little shaping of the leaves and branches, it ended up looking like this. This post contains affiliate links for your convenience. Please see my full disclosure HERE. A few things that impressed me – the bark on the trunk and branches. It looks surprisingly realistic. It’s a brown tissue type paper that is glued on to the trunk and branches that created a crinkly bark look. You can see what I mean in the pictures below. Also, the details on the leaves is pretty remarkable. 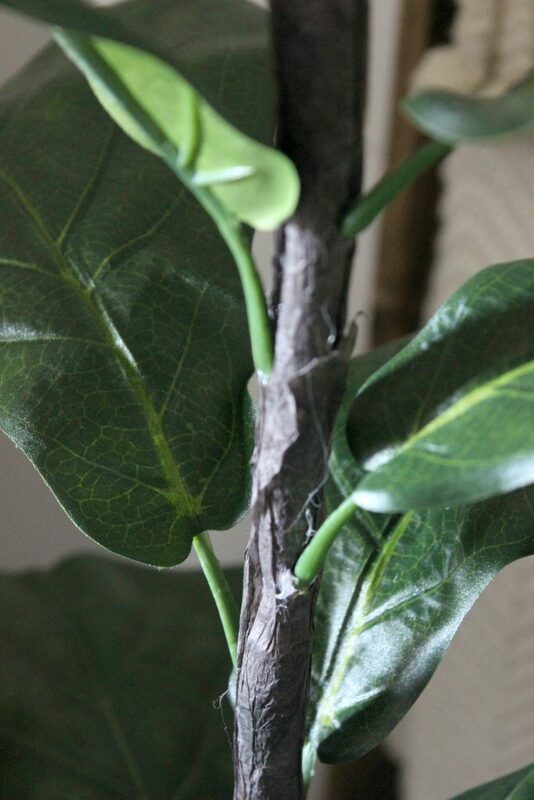 The photo below shows the leaves side by side with my real fiddle leaf fig. 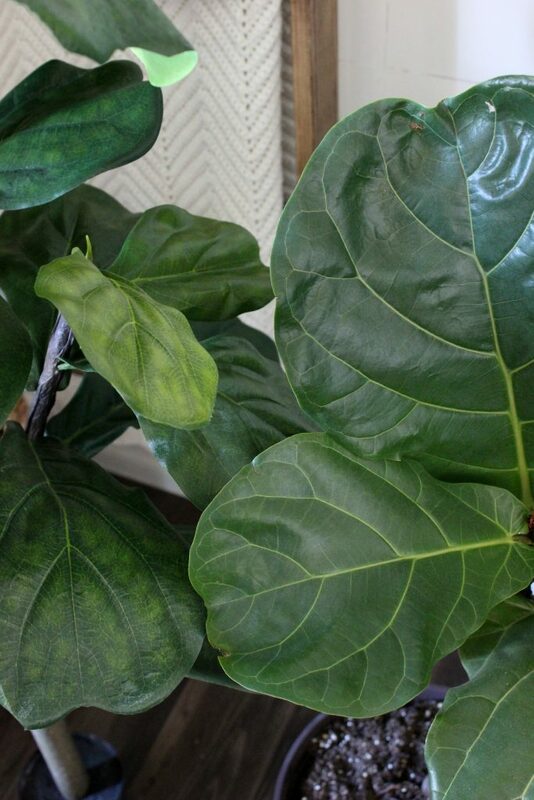 You can see that the leaves on my real plant are definitely larger, but the detailing of the veins in the leaves is great on this faux version. One thing that is somewhat annoying is the teeny tiny pot that holds this tall faux fiddle leaf fig. It is weighted, but with the height of this faux plant, it topples over pretty easily. 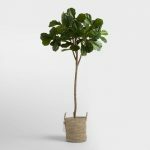 Of course, you will want to put this into a larger basket or planter, but it will need to be supported around the sides to keep it from toppling when bumped. And, if your house is like mine, things do get bumped! So, here’s how I solved this problem and made it look even more realistic. 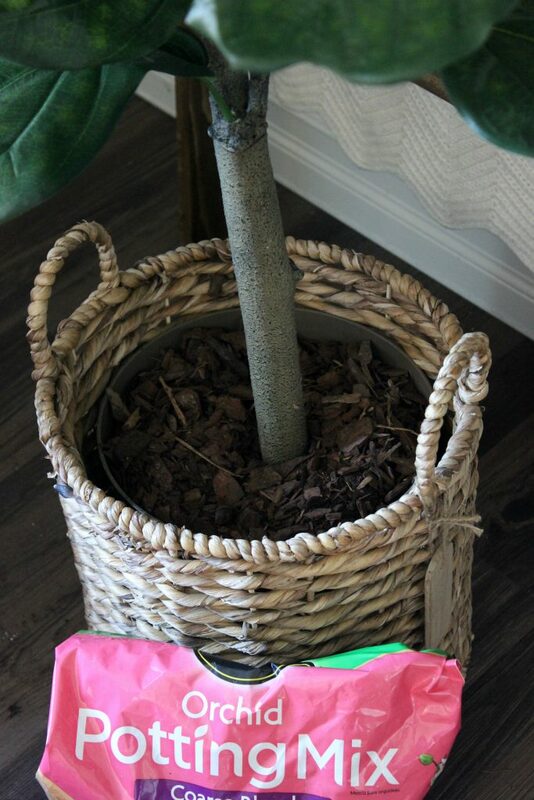 I put the faux tree into a basket with a large plastic pot. 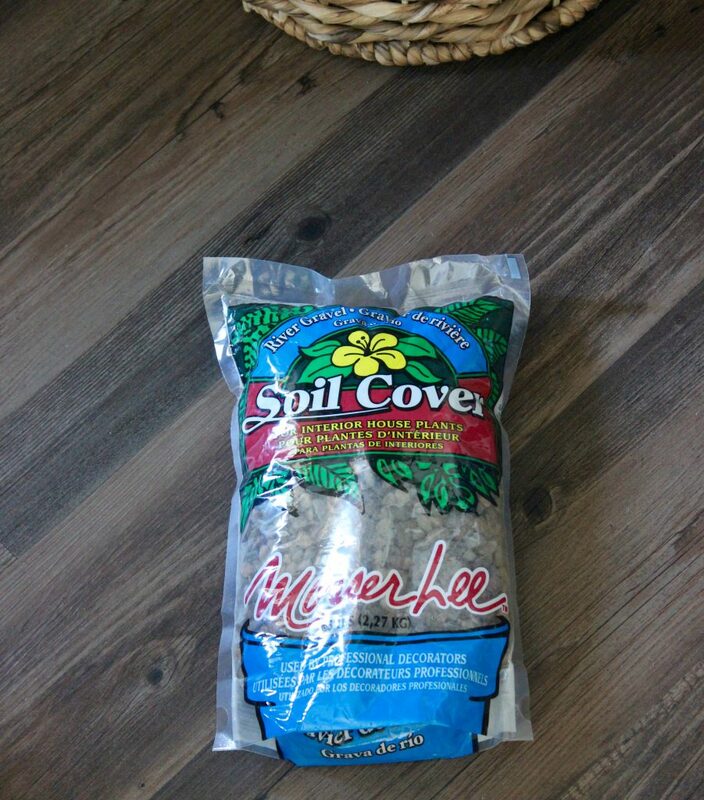 Then, I added a bag of this gravel soil cover that I got at my local greenhouse. It’s just enough to secure the base of the small pot this tree comes with inside the larger plastic pot. Then, I filled the entire plastic pot with this Orchid Potting Mix. 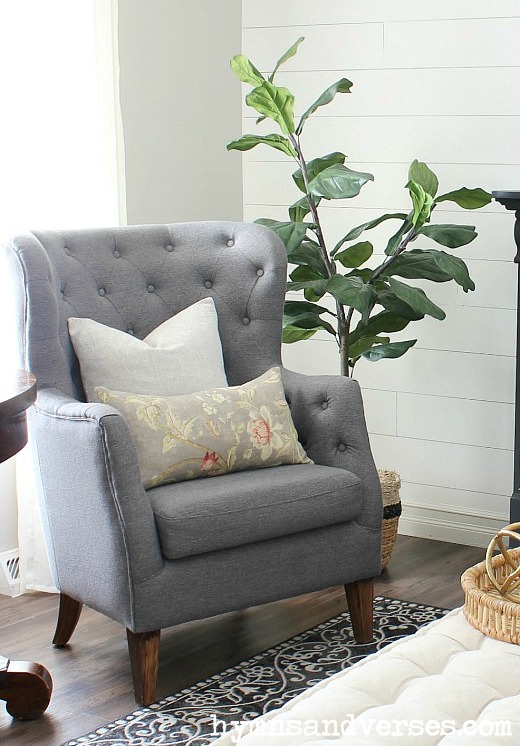 It’s chunky and works well to secure the faux tree even more. I think it really makes this tree look even more realistic. Here’s a look at the size compared to my real fiddle leaf fig that I’ve been trying really hard not to kill! I got the real plant for $24 a few months ago. It has failed to grow in it’s currently location, so I’m going to see how it likes my office when it’s finished. Hopefully it will do better in that space. The faux tree was under $60, including shipping. It’s around 5 foot tall and I don’t have to worry about where I put it. And, the obvious, I don’t have to water it! Here’s a side by side comparison of real and faux. If I had to give a negative, I’d say I wish some of the leaves on the faux version were a little larger in size. But, I’ve found that most faux versions of this popular plant have smaller leaves than the actual plant. 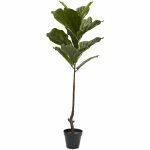 Overall, I think this faux fiddle leaf fig is a great value! Now, here’s is the negative that I really hate to share. 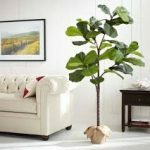 I think word has spread over the internet that this is a great faux fiddle leaf fig for a fantastic price (most faux trees of this size are more in the $100 – 300 price range!). Because of this, by the time I received my tree in the mail, this one had sold out once again! So, unfortunately, you won’t be able to get one like this right now. I will be watching to see when it comes back into stock and will let you know as soon as it does! 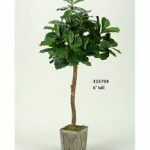 If I find another faux fiddle leaf fig tree in the meantime that has a great price and looks good, I will let you know that too! Below are a few that have been reviewed from some other bloggers that have good reviews. Thanks for stopping by today! Don’t forget to pin this! I got it at QVC, but it is currently sold out. I love this plant – thanks for the update and please keep us updated if it becomes available. I purchased it immediately after reading your earlier post about it- the price was great, so I took a chance instead of waiting for your review. So happy I ordered it- I am loving how it looks in my dining room. Thank you so much for sharing the info. I have a ton of house plants, but I have to say that fiddle leaf figs are the most persnickety! Unlike traditional fig tree (ficus) they are tricky. You see them everywhere and get the idea they’re easy, but they are not. I have 5 currently. most of them I sent outside (on the covered patio) for some summer rehab. It’s amazing what 5 months outside will do to them. One of them was especially ugly so I hacked it down to stems only. Now it has 2′ of beautiful new leaves. Just brought them in last week due to freezing overnight temps. Hope they readjust! Thanks for giving us the review, it looks great at your house! 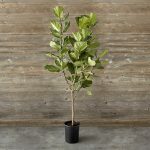 Thank you so much for the heads up on the tree being back in stock. I could not click on the site and buy it fast enough. Can’t wait until it comes in. Thanks for letting us know about it coming back in stock. I got mine in a few days ago and I LOVE it!!! Definitely worth the money. I’m so glad you like it, JoAnn!